The Outdoor Mini Pod Sauna is a unique design that will enhance your urban backyard, ski chalet or lakeside cottage. 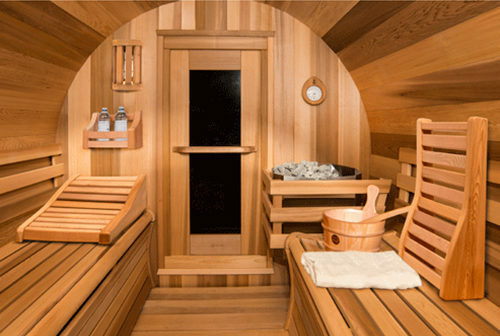 Handcrafted in Canada with Canadian western red cedar this quality kit will give you years of sauna enjoyment. The Outdoor Mini Pod Sauna is a unique design that will enhance your urban backyard, ski chalet or lakeside cottage. Handcrafted in Canada with Canadian western red cedar this quality kit will give you years of sauna enjoyment. A full length tempered glass window on the door allows in some natural light for added relaxation. Enjoy the great outdoors all 4 seasons with this stylish sauna at your home or cottage! Clear red cedar inside walls and benches. Knotty cedar bevel siding roof. SaunaCraft Made in Canada stainless steel electric heater. Add a bucket and ladle and sauna thermometer to your package.